Warren Gatland is the 2013 British & Irish Lions coach and is one of the most well respected coaches in world rugby having led Wales to Grand Slams and Wasps to domestic success. He achieved great success as a player in New Zealand before making his name as a coach in the northern hemisphere. By the time of his retirement in 1995, Gatland held the record for career appearances for Waikato with 140. Gatland spent the off season coaching in Ireland and Scotland before taking a player/coach role with Galwegains RFC in Galway. From here he graduated to coaching the regional Connacht side, and with restrictive resources guided them to the quarter final of the 1997 European Challenge Cup, including two remarkable pool stage wins over Northampton Saints. Gatland's success with Connacht led to his appointment as Brian Ashton's successor as Head Coach of Ireland. Again working with an underperforming team, he was able to secure a famous away win against France during the 1999 Five Nations but paid the price for a poor showing at that autumn's World Cup. Defeat to Argentina in the quarter-final play-off ended the Irish campaign and signalled the beginning of the end for Gatland. He was eventually replaced by his assistant Eddie O'Sullivan in 2001. Gatland's next step took him to London Wasps, where he took a coaching position prior to the departure of Director of Rugby Nigel Melville. In his first season in charge he secured the club's top flight future by guiding them to safety in his first months in charge. Wasps went on two win three successive Zurich Premiership crowns under Gatland between 2003 and 2005 and triumphed in the 2004 Heineken Cup against Toulouse. Gatland's immediate future post Wasps lay with his hometown club Waikato, whom he coached during the 2005 NPC Championship. He then led them to the first title of the new Air New Zealand Cup in 2006. He joined the Chiefs Super Rugby franchise later that year as a technical advisor. In November 2007 Gatland made his return to international rugby as the coach of Wales. In his first game in charge he and new defence coach Shaun Edwards led Wales to their first win at Twickenham since 1988 and then to a triumphant Grand Slam, only months after their humbling exit at the group stages of the 2007 World Cup. In 2009 Gatland was again in action with Edwards, as forwards coach to Ian McGeechan's British & Irish Lions as they slipped to a thrilling 2-1 series defeat to South Africa. On the eve of the 2010 autumn internationals, Gatland ended speculation regarding his commitment to Wales by signing a new four-year deal with the Welsh Rugby Union - keeping him at the helm of the national side until the conclusion of the 2015 Rugby World Cup. As a result, Gatland became Wales' longest-serving coach during the 2011 Six Nations. Gatland guided Wales to fourth place in the 2011 competition and overhauled the side going into the 2011 World Cup. After suffering a heart-breaking loss to South Africa in the opening match of their campaign, Gatland guided his side through to the quarter-finals of the tournament. They overcame Ireland to tee up a semi-final showdown with France. Sam Warburton was awarded a controversial red card and Wales were left to contend for the Bronze Final with Australia. After finishing fourth in the tournament, Gatland's Wales were pre-tournament favourites to lift the 2012 Six Nations trophy. Gatland's side started the campaign with an impressive win away at Ireland and backed that up with a victory over Scotland at the Millennium Stadium. And they secured the Triple Crown against England at Twickenham thanks to Scott Williams' late try. Wins against Italy and France meant that Gatland had led Wales to their third Grand Slam in eight years. 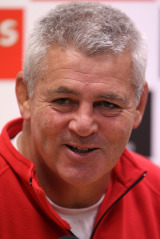 That success sparked speculation that Gatland would be the coach for the 2013 British & Irish Lions tour to Australia. Despite suffering two broken ankles in April, Gatland recovered sufficiently to head up the tour and was unveiled on September 4, 2012. Gatland led the Lions to a 2-1 tour series victory over the Wallabies - their first series win since 1997 - and was ultimately vindicated for his widely criticized decision to drop Brian O'Driscoll for the final decisive Test against the Wallabies.